At Termales del Ruiz, Caldas, Colombia. 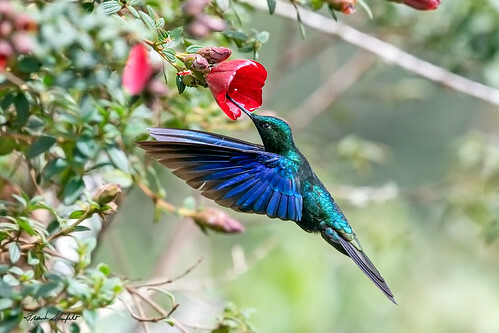 This is the Great Sapphirewing (Pterophanes cyanopterus), one of South America's largest hummingbirds appropriately named because of its size between 15.5-17.5 cm (6-7 in) in length, and its spectacular sapphire wings. 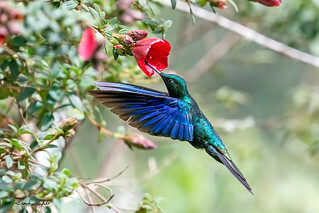 The Great Sapphirewing is found at higher elevations in the Andes Mountains of Bolivia, Colombia, Ecuador, and Peru. This image was taken at 3,500 meter or about 11, 500 feet above sea level.